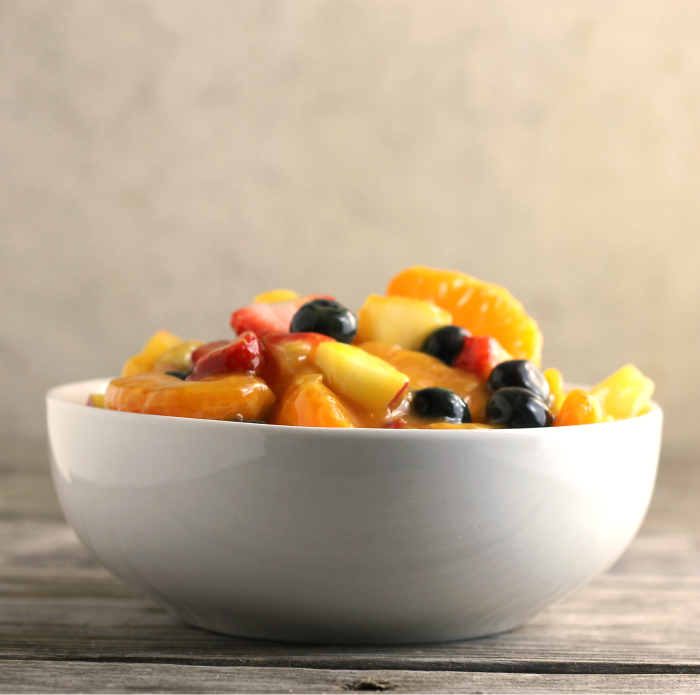 Dress up your fruit salad with pudding and fruit juice. 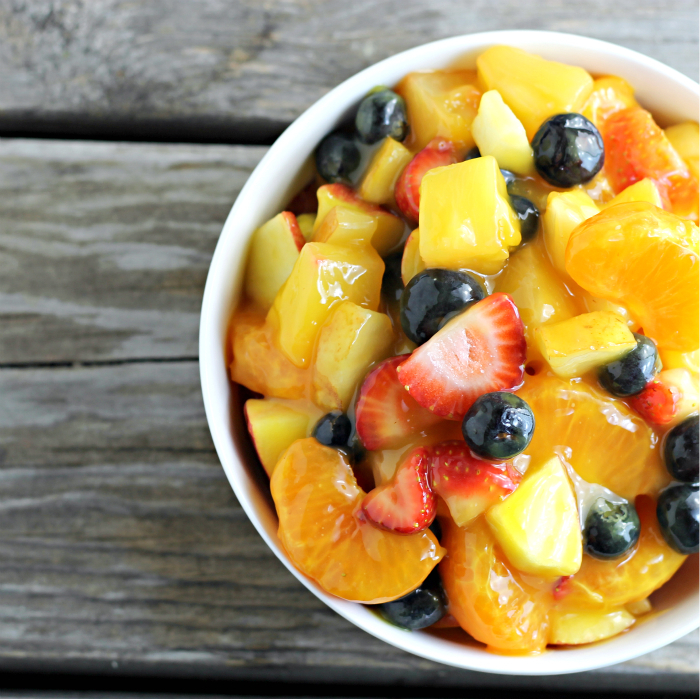 That is all it takes to make this glazed fruit salad. I love serving fresh fruit with each meal. It makes a great side dish for any meal. And who doesn’t love a bit of fresh fruit? I started this way back when our kids were little. They were all pretty fussy eaters (some of them still are a bit fussy) and knowing that when I set fresh fruit on the table that it was something they were sure to eat and, at least, have something healthy. It’s a tradition that I have still do today, even if it is just Mike and myself sitting down to eat. Usually, it is whatever fruit that is in season or maybe a combination of fruits that are in season. This past weekend was the beginning of birthday celebrations in our house. Yes, our son-in-law’s birthday is the first birthday of the year and as always we celebrate by making a special birthday dinner for the birthday person. As always I wanted to make a fruit salad of fresh fruit, but I wanted a way to dress up the fruit salad, to make it something special. When I was going through my recipe box, I found a recipe that I had all but forgotten about. I am sure that mom gave it me at one point, but it was a recipe that came from my mom’s sister. She was a very special aunt of mine that was a terrific cook and baker, so I knew that it would be yummy. I was so excited when I found the recipe and knew that it would be perfect for the dinner that I was planning. The recipe could not be any easier; it really dresses up the fresh fruit and adds a yummy flavor. All it takes is a box of pudding the kind that you cook and fruit juice. 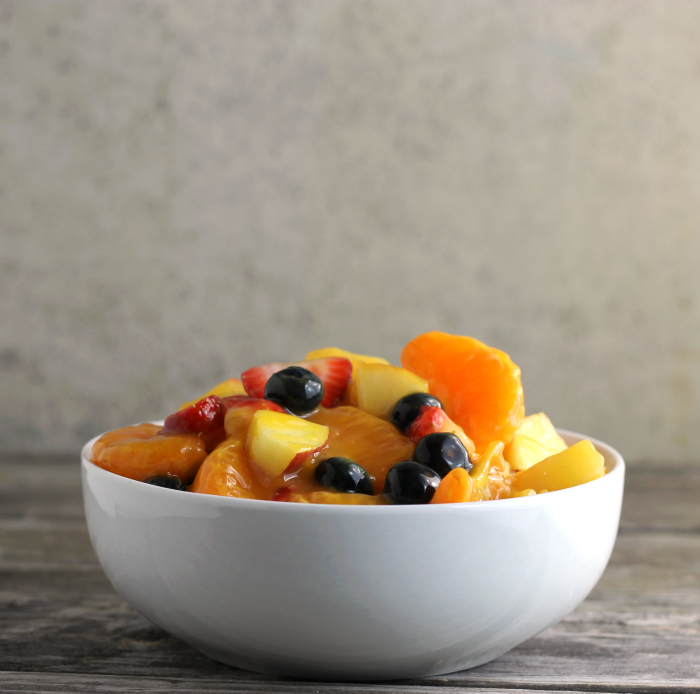 It is kind of crazy that just two simple ingredients can turn plain fruit into a scrumptious fruit salad. 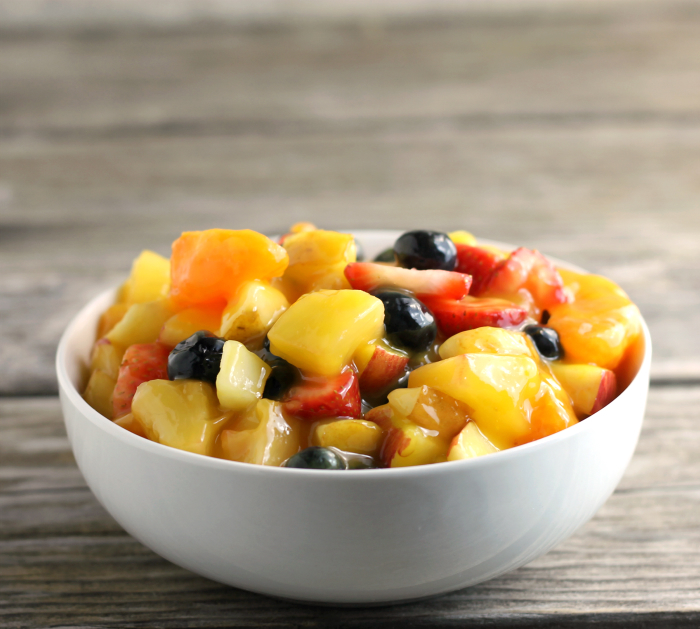 It goes perfectly with any fruit… fresh fruit or if you prefer you can use canned fruit, either way, your fruit salad will be yummy. In a small saucepan combine the juice and pudding. Over medium heat bring the juice and pudding to a boil. Remove from heat and cool completely. While the glaze is cooling prepare the fruit. When the glaze has completely cooled pour over fruit and fold in, until the fruit is evenly covered. If you prefer to use another fruit juice feel free to do so. Also, use the fruits that you and your family enjoy. If you prefer canned fruits over fresh fruit they can be used. I love all of the winter fruit you have in this salad, Dawn! We always eat fruit at lunch every day, and I’m thinking this fruit salad would be a fun way to mix it up next week! Love fresh fruit! Particularly at this time of the year when it’s not so available. This looks great — very simple, but very flavorful. Good stuff! Thanks. What a great idea!!! And I bet it makes a scrumptious glaze!